The 2015 release of Stone's Old Guardian barley wine is billed as "Extra Hoppy," but it's not exactly what I expected. Stone excels at hop overloads, so when they promised big hops in this year's OG, I expected something as bitter as a spinster's taint... maybe more of a DIPA than a barley wine. I was wrong, and I feel silly for having been too simplistic. 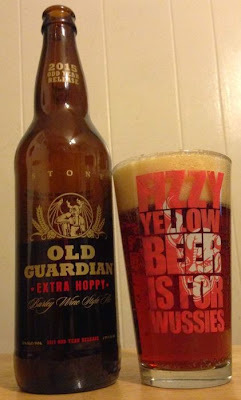 This thing is pure barley wine, as true to the Old Guardian tradition as previous releases, with a syrupy body and heavy, boozy presence. It pours a clear, bright, cinnamon/amber color with a thick and tacky head. The aroma is big caramel, apples, nutmeg, butter, and dense, roasted malt. the flavor is strong and sweet, adding brown sugar, molasses, scotch and raisins to the aroma. Those extra hops come through on the back end, adding candied pineapple and some grassy tone. The hops are there, and pungent, but they never bend this beer toward IPA at all. This is a barley wine, and a hard-working one a that.